Foundation cracks are not just unattractive, they can threaten the stability and value of your Toronto home. Your foundation is paramount to keeping your home stable and safe. Because foundations are rigid, it’s not uncommon for unsightly cracks to break through the surface. Minor cracks are generally nothing to worry about, but larger cracks may indicate severe movement that can interfere with the overall stability of your home. That’s why it’s so important to fix cracks as soon as they develop, before they have a chance to expand and worsen. Concrete shrinks in cold weather and expands in hot weather, this movement eventually leads to the development of tiny surface cracks. Even in ideal conditions, concrete shifts here and there. Movement doesn’t always result in cracks, but over time enough movement usually causes cracks to form. Cracks in your basement, garage, patio, or in-ground pool are often caused by drying shrinkage or thermal movement. Small cracks like these are not that big of a deal, hence why they often go ignored. Over time, small cracks that are not filled in turn into a big deal because water seeps inside and starts to ruin the foundation, ultimately leading to loss of structural integrity. When Are Foundation Cracks Considered Severe? 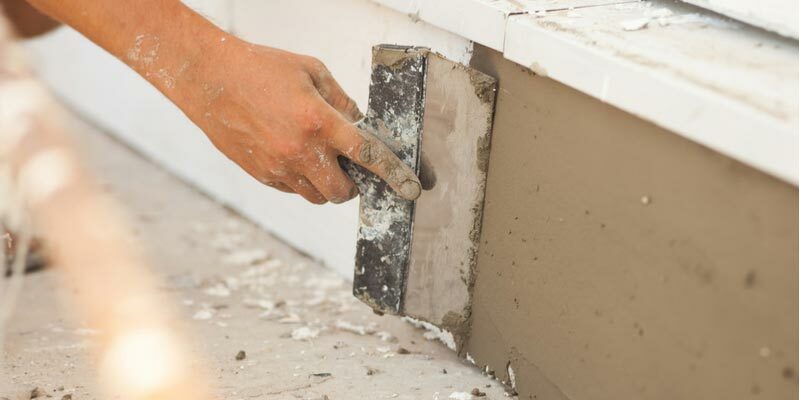 If you notice many cracks in your foundation, or there are cracks that measure larger than ¼-inch wide, you should call out an expert right away. This could point to a serious foundation issue that requires immediate repairs. First and foremost, give Turnbull Masonry a call! We are happy to assess foundation cracks and make the appropriate repairs and recommendations. There’s a reason we’ve been in business for so long, we know how to get the job done right the first time around. Small or minor cracks can be fixed by applying a low-pressure injection containing a polyurethane foam or an epoxy material. There are epoxies and polyurethane materials made especially for concrete floor cracks. -Mix the concrete patch so that it is the proper consistency, comparable to a thin paste. When repairing cracks, it’s important to use the right materials to make the job worth your while. Fill concrete cracks with a material that contains some elasticity to reduce the risk of reappearing cracks. It’s not easy to get the job done without the mix drying up, that’s why it’s recommended to mix small portions of cement paste as you go. -Spritz a little water over the crack before troweling the pre-made paste into the slits of the crack. Applying a little moisture to the crack before you fill it in helps prevent moisture in the concrete patch from escaping. If too much water escapes, patch material is prone to cracking and will fail to properly bond. Beware, too much moisture can deter the process as well. -Remove excess paste to create a seamless finish. Use the trowel to scrape away the excess paste overflowing from the crack. Properly scrapping away excess materials leaves a smooth and clean finish. -Clean up materials as quickly as possible. Buckets and tools that contain patching material need to be cleaned as soon as possible. Otherwise, the materials dry up and become next to impossible to remove. Once again, give us a call! You’ll need to use different materials to fill in cracks that measure over ¼-inch but are determined non-structural. Some recommend using a latex caulk containing silicone or a polyurethane caulk. The appropriate mix can be applied using a caulking gun, albeit this doesn’t provide the same seamless finish as other methods. It takes very little time to fix small to moderate foundation cracks. We will be in and out in no time! This affordable maintenance service ensures that your foundation remains secure and protected against worsening cracks and water damage. Anyone that’s ever dealt with a compromised foundation wishes they’d taken the time to keep up with affordable maintenance repairs. The price you pay to fix a badly damaged or instable foundation far exceeds the cost of minor repairs. You could try and repair foundation cracks DIY style, but we don’t recommend doing so unless you have a good deal of experience. Your foundation supports your entire home, and that’s nothing to mess around with. For superior service at competitive prices, you can count on your friends at Turnbull Masonry!